Megan Schossow and Diane Kampa staffed the UMASH outreach table at the Farm Progress Show that was held August 28-30 in Boone, Iowa. 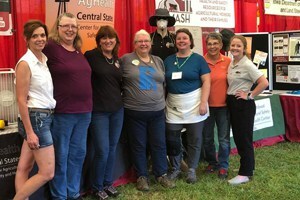 UMASH, along with our US Ag Center partners at the CS-CASH center in Nebraska and the GPCAH center in Iowa, the AgriSafe Network, and other groups engaged with farmers in the Health and Safety Tent that was hosted by the Iowa Department of Public Health. Our outreach efforts included sun safety, heat illness, needlestick prevention, and the Farm Safety Check resource. We also conducted an informal poll about whether attendees (or someone they knew) has been injured or had a close call doing various farm activities. Incidents involving ATVs, tractors, grain bins and falls from ladders were reported most often suggesting educational outreach and training continues to be important in these areas. Attendees were encouraged to visit our website for more information on training videos, fact sheets and research based information for school projects and papers. Pictured: IA, MN and NE Ag Safety Warriors in action at the Boone Iowa Farm Progress Show! Linda Emanuel,Kathy Leinenkugel, Ellen Duysen, Gayle Olsen,Marsha Cheyney, Charlotte Halverson, Megan Schossow and Ken.